My methods work. Every year several of my students take our state Biology End of Course Exam (EOC) as part of their high school graduation requirements. After only 35 hours of hands on instruction for the entire year, and no test preparation, all of my former students that have taken the Biology EOC have passed the exam. Read some of the testimonials from former students and their parents. "Mrs. Taylor - I really enjoyed taking your chemistry class this year. You made the subject easy to understand and exciting to learn. Thank-you so much!" "All three of my boys have taken Mrs. Taylor's Biology and Chemistry courses and they not only learned Chemistry, they learned to love chemistry and did well in their college courses. And the one who complained the most about her insistence on accuracy in notation and detail in lab reports is the one who is now an honors major in Biochemistry, working his way through college as a Chemistry T.A." 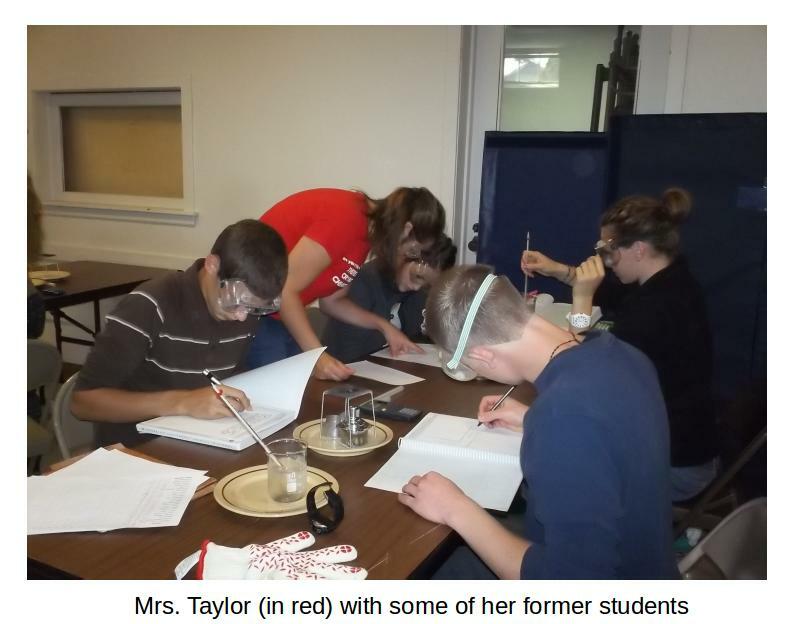 "Mrs. Taylor gave chemistry and biology a perfect balance between the simple understanding I needed for a high school class, and the attention to detail that I needed to be prepared for college level classes." "Rebecca - I love your teaching method and excellence!" "Mrs. Taylor - Wow. This year was amazing! I learned so much and I can't thank-you enough for taking your time to teach chemistry. I was so blessed to have you as a teacher. Thank-you for the lecture notes. They are like gold to me! You are truly my favorite teacher. "Dear Rebecca - Thank you for all you did for the chemistry students this year. I know that you poured your heart and soul into teaching them and I am so grateful my daughter had the opportunity to experience your class!" "Mrs. Taylor - I just wanted to let you know that I really enjoyed your class this year. I have learned so much and enjoyed doing it every step of the way. I wasn't sure how I would like biology, but I loved it from the very first. You make your classes so engaging and fun, and biology was something I looked forward to every week. You're my favorite teacher I have ever had and I look forward to taking chemistry from you next year!" "Mrs Taylor - Your enthusiasm really encouraged me to try my best and study a lot. I never thought I would enjoy studying science. You are an amazing teacher!!" "Thank-you so much, Mrs. Taylor, for teaching us the past two years. Thank-you for taking the time to prepare all the classes and notes! You were such a great teacher I wish I could take biology again next year. Thank you for teaching me biology and chemistry in an easy and understandable way.